An explanatory story detailing the harrowing journey Jon Kent and Jor-El faced in space. 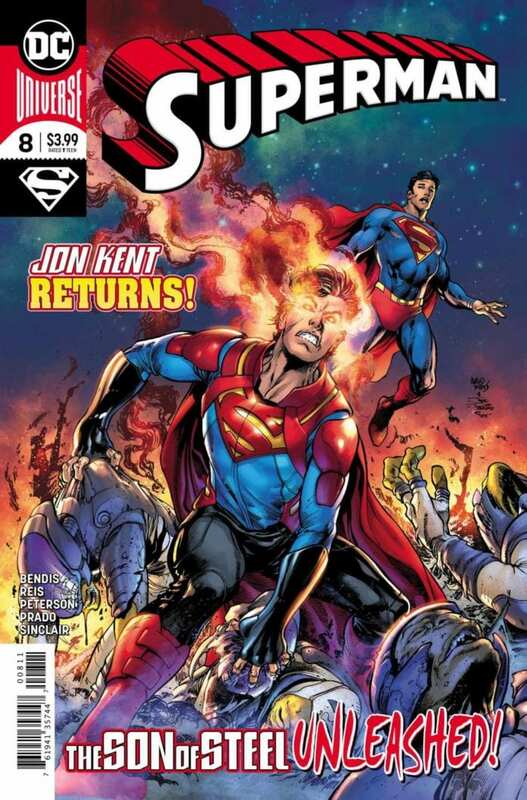 After SUPERMAN #7 brought Jon Kent back from his space excursion with grandfather Jor-El, readers have been waiting anxiously to learn what happened during that time. The former 11-year old seems to have gained an additional six years on his life during the few months of space travel. And now Superman must learn what happened during Jon’s travels and confront the existential implications of the journey. Brian Michael Bendis dives right into the heart of this story from the get-go. We’re shown a flashback scene from the beginning of Jon’s trip with Jor-El wherein the patriarch asks point blank why Jon wanted to come in the first place. You can almost hear Jon’s internal monologue as he weighs his options on how to respond. He initially explains how cool it would be to travel in space. But then immediately unpacks a much more somber claim: He wanted answers about his purpose and place in the universe. Jor-El’s response to Jon’s internal crisis of identity comes in the form of his own shared sense of existential anguish. The aging scientist contemplates whether his attempt to find some sense of order in the universe was actually sheer madness. To him, the improbability of his survival of Krypton’s destruction, as well as Jon’s existence in the first place, seems to throw all ideas of a rational cosmos out the window. The reader can sense his escalating despair, especially when witnessing its effects on Jon. Bendis also gives Clark and Lois two realistic reactions to Jon’s story. The guilt-ridden Lois bemoans her decision to let Jon leave on such a dangerous trip and questions her competency as a parent. Shortly thereafter, Clark tries to cope with the fact that he missed seeing his son grow up. 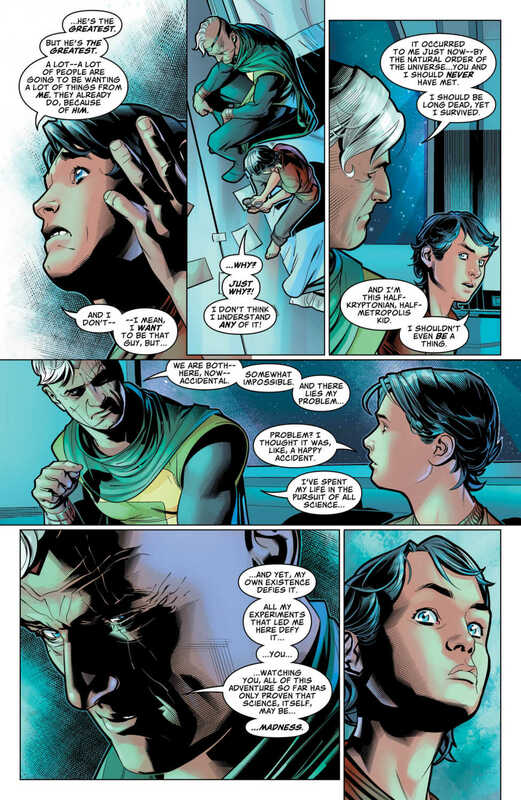 The reader can feel Clark’s seething anger at his father and Lois’s unbearable guilt from leaving Jon with such a man. All of the Kent’s express their anxiety and angst in their own ways throughout the issue. And the tension only escalates as Jon describes even more bewildering tales of his trip. Joe Prado, Ivan Reis, Alex Sinclair, Josh Reed and Brandon Peterson work together to create beautiful artwork fitting of a Superman story. Sinclair’s varying shades of primary colors, combined with Prado’s inking, emphasizing the centrality of the House of El in this issue. In addition, Reis’ and Peterson’s sharp edges and effective use of shading serves as a direct contrast, which further highlights the angst and anxiety each member of the family is feeling. And Reed’s lettering helps showcase the differences between each character’s manner of speaking. In addition to the main cover and and story artwork, Rob Liefeld adds his talent via the variant cover. 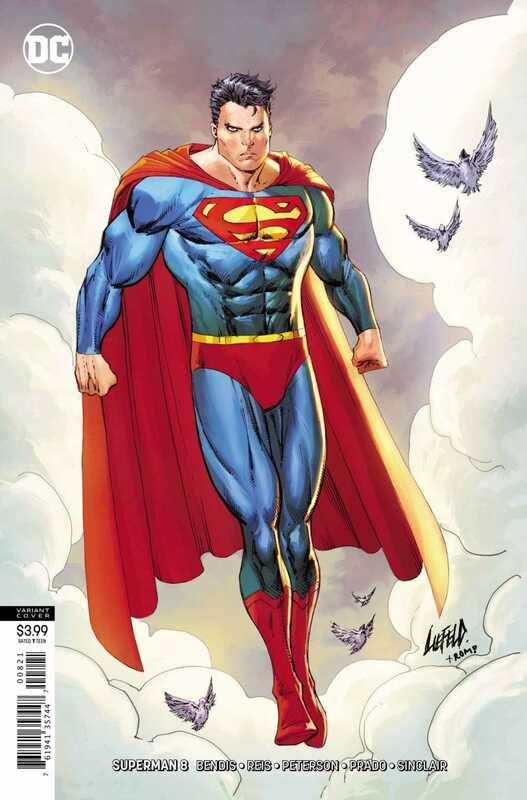 He depicts the Man of Steel in his more classic form, using brighter colors and fewer shadows. Nevertheless, the intensity of the story is foreshadowed in his expression. SUPERMAN #8 offers readers a satisfying return for Superboy while holding enough information back to keep them wanting more. It’s up to Bendis and team to keep the anticipation high as they reveal more secrets of Jon’s travels in the issues to come. 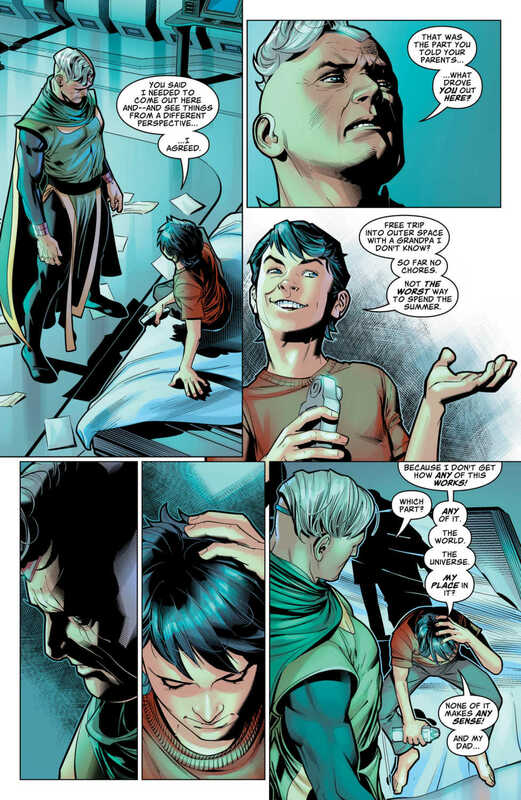 What did you think of Superboy’s return in SUPERMAN #8? Let us know in the comments below!